Google's smart contact lens is awesome, but it's not what you think. 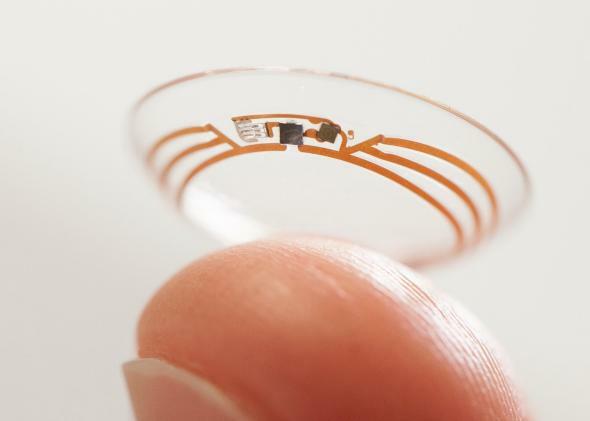 Google’s smart sensing contact lens doesn’t have a heads-up display, but it could lead to major quality of life improvments for diabetics. Google announced on Thursday that it wants to start making smart contact lenses embedded with “chips and sensors so small they look like bits of glitter, and an antenna thinner than a human hair.” But the contact lens won’t be Google Glass for your eyeball—it’s going to measure the glucose level in tears to give diabetics crucial information without pain. It might seem a little creepy to have circuitry in a contact lens, but it will certainly be worth it for diabetics who have to prick their fingers or draw drops of blood from their forearms multiple times a day to check their blood glucose levels. By having consistent glucose readings instead of highly intermittent ones, diabetes patients will have more control and better ability to fine-tune their daily regimens. And tears are a good fluid for glucose measurement, though they’re usually tough to collect for analysis. So yeah, contacts obviously solve that problem. Though this may seem like Amazon PrimeAir-type fantasy, Google says it is in talks with the FDA and wants to shop for manufacturers and other partners to actually get the project off the ground. A commercial debut is probably still years off, of course, but Google probably wouldn’t have made the announcement on a random Thursday evening if it didn’t feel like it had some momentum. We’re now testing a smart contact lens that’s built to measure glucose levels in tears using a tiny wireless chip and miniaturized glucose sensor that are embedded between two layers of soft contact lens material. We’re testing prototypes that can generate a reading once per second … It’s still early days for this technology, but we’ve completed multiple clinical research studies which are helping to refine our prototype. Down the line a device like this could also collect biometrics like heart-rate data and coud make bulky/weird personal tracking gadgets a thing of the past. And maybe, just maybe, there will eventually be a hipster renaissance where smart contacts are rejected in favor of smart Warby Parkers.